In a few hours, 2013 will be a memory. And looking back at this past year in the performing arts, dance and film have been everywhere. In twelve short months, these creative collaborators have gone from artsy dance films to television competition/reality series to live interdisciplinary performance to 3-D movie telecasts to dance documentaries. In this last category, dance and film meet under unique circumstances, sharing a real-life story that allows the performing arts community to make the imperative link between today’s work and the past. But just like everything else, some documentaries are better than others. What distinguishes the best documentaries is when the subject matter is great and the filmmaking is great. 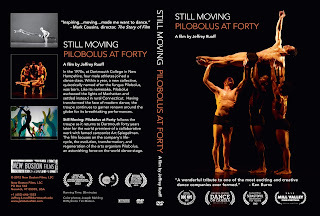 Jeffrey Ruoff’s new film, “Still Moving: Pilobolus at Forty” meets both criteria. While aptly chronicling the history of this dynamic, one-of-a-kind troupe, Ruoff mixes archival material, interviews, rehearsal footage and performance film with thoughtful and careful interdependence. From the early stages of inception to the present day company, “Still Moving: Pilobolus at Forty” captures the ever-changing nature of artistic creativity. The story told by “Still Moving: Pilobolus at Forty” begins in the early 1970s at Dartmouth College in Hanover, New Hampshire. The film notes that at this moment in time, the campus was dominated by a culture of newness, change and beginning. And for a small group of students, dance was part of ‘the new’. With no pre-conceived notions about movement and no previous training, these brave souls leapt into the creative forces of dance and physicality. Pilobolus was birthed (its namesake, a phototropic fungus) and the stage was set for collaborative practice and collective composition. While Pilobolus’ initial core group went through some changes, three voices emerged and came together as the artistic directorial team: Jonathan Wolken (who unexpectedly passed away in 2010), Robby Barnett and Michael Tracy, all of whom are interviewed throughout the documentary. Through these interviews, the early years of Pilobolus are remembered: constructing movement vocabulary; building style; defining look. Shapes in space were a fascination for all involved and more specifically, how dancers moving together could create new and more intricate patterns. To that end, contact partnering really became embedded in Pilobus’ work. Rather than textbook contact improvisation, they envisioned a more collective, interactive conversation between bodies. The examination of formal choreographic concerns were of equal importance including issues of performance and process alongside space and time. But “Still Moving: Pilobolus at Forty” is clear to show that for this group of artists, nothing was static. Instead, Pilobolus opted to look toward evolutionary systems and the migrating intersection of science and art. With the background information established, Ruoff turns his focus to Pilobolus today, focusing on what has changed and what has stayed the same. After forty years, the company has grown into an arts organization with several different arms. 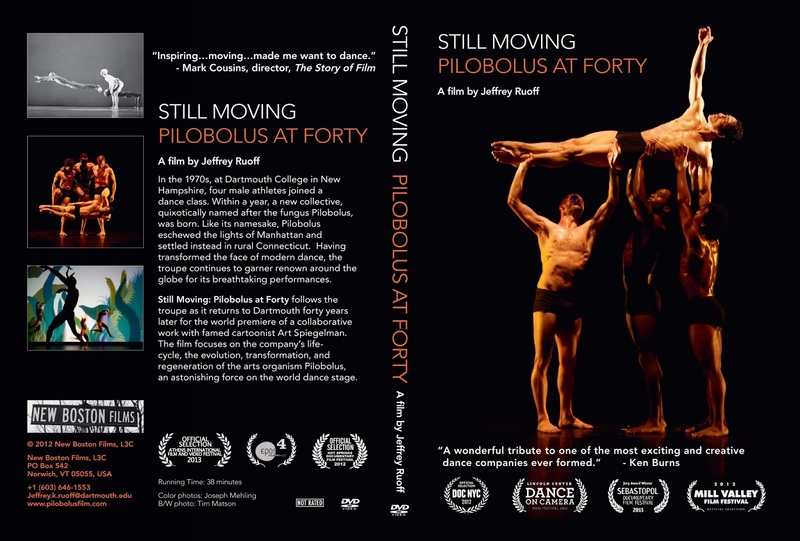 “Still Moving: Pilobolus at Forty” focuses mostly on the performing company, Pilobolus Dance Theater, and the teaching program, the Pilobolus Institute. For the former, Ruoff follows the group as they prepare for the 40th anniversary performance at Dartmouth College, featuring a new collaboration with Art Spiegelman. And with the latter, Ruoff gets a front row seat to a number of master classes. With any good documentary, the viewer knows more about the subject matter than they did before. And with Ruoff’s documentary, this is certainly true – in thirty-eight short minutes, the audience has learned a great deal about Pilobolus and their vital contribution to the performing arts. But the great documentaries have an additional, somewhat quieter result. Aside from the gained knowledge and detailed information, they bring realizations. “Still Moving: Pilobolus at Forty” reveals that over four decades, the dance group has been able to morph while still staying true to its initial core vision. And for those who are lucky enough to be Pilobolus ‘insiders’ – dancers, artistic staff, technical team – their personal experience is a deliciously unspecified, yet guided, journey.